This contemporary Murano Venetian glass pendant features beautiful color palette with stylish infused silver foil pattern, which showcases centuries of Murano glass artistic tradition. Each pendant is handcrafted using a layering technique so colors won't rub off, wash off or fade. The clean simple shape contrasts with the unique design to create an elegant look that is truly Italian. Wear this pendant on your favorite silver necklace or just on a simple cotton or leather cord. Colors include: silver, black, bronze & cocoa brown. 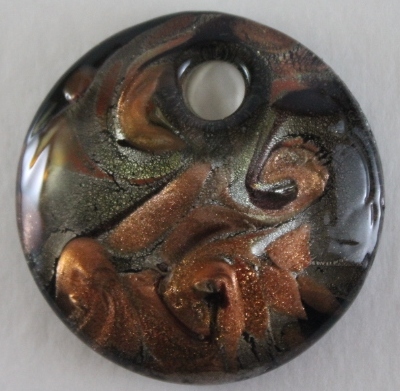 This gorgeous pendant measures 2 inches.